Are Soy Beans Good for Diabetes? Soybeans contain rich amounts of vegetable protein. 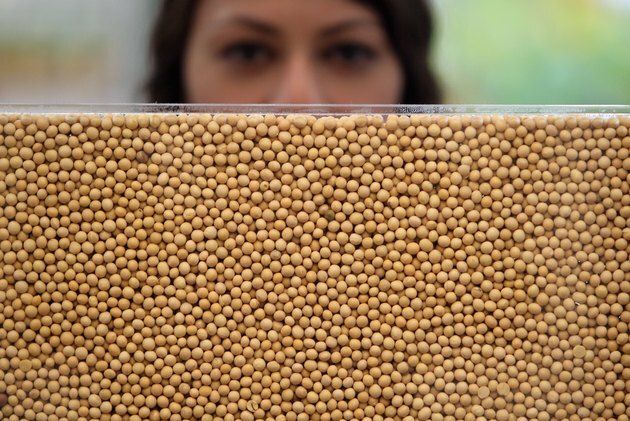 Americans commonly eat soybeans and soy foods in place of animal protein in vegetarian diets, but science suggests soybeans are beneficial for more than just their protein content. Soybeans provide a concentrated source of compounds called isoflavones, also referred to as phytoestrogens, because their structure resembles the female hormone estrogen. These compounds offer potential benefits for individuals with diabetes. Insulin resistance is a common characteristic of type 2 diabetes and occurs when your cells become insensitive to the effects of insulin. Having Type 2 diabetes increases the risk of heart disease, especially for postmenopausal women. Data suggests soybeans benefit postmenopausal women with type 2 diabetes, according to a study published in the October 2002 edition of "Diabetes Care." The study found that phytoestrogens in soy decreased heart disease risk by improving insulin resistance and cholesterol in postmenopausal women with type 2 diabetes. Soybean supplementation can help control blood glucose if you have type 2 diabetes, researchers in Korea report in a study involving participants who took 69 grams of roasted soybean powder three times daily for four weeks. Soybean supplementation resulted in significant improvements in fasting glucose and post-meal glucose levels, according to the study, published in the journal "Nutrition and Research Practice" in September 2008. Nephropathy is a common complication of diabetes that occurs when kidney structures called nephrons sustain damage. Individuals with diabetes often exhibit nephrons that thicken and become scarred over time. In an animal experiment, scientists discovered soybean consumption helps with kidney scarring and function. In an article published in the December 2010 edition of "Evidence-Based Complementary and Alternative Medicine," the researchers postulated that eating soybeans to improve glucose control may prevent complications such as nephropathy. Soybeans have a low-glycemic index and are rich in fiber, making them a good addition to your diet if you have type 2 diabetes. The serving size for beans, including soybeans, is 1/2 cup cooked. If you're interested in adding soybeans to your diet, fermented soybeans appear more beneficial for type 2 diabetes than nonfermented varieties, according to a review published in "Nutrition Research" in January 2010.